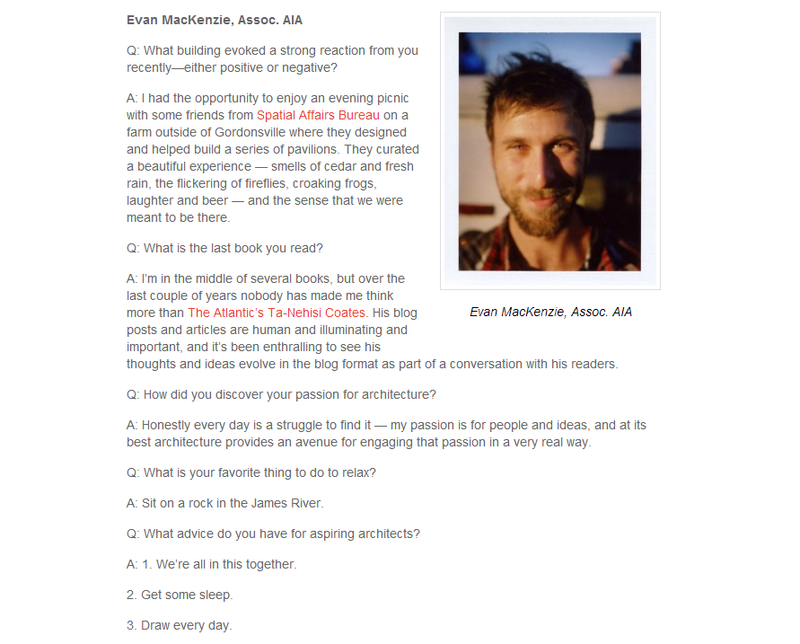 Congratulations to Evan MacKenzie, Assoc. AIA, a member of Glavé & Holmes’ Urban Architecture Studio, on being part of the prestigious 2014 Virginia Society AIA Emerging Leaders in Architecture (ELA) program. Evan is one of 16 individuals to make up to 2014 class of Emerging Leaders, selected based on their potential to be outstanding contributors to the profession and the community. The goal of ELA is to help emerging architects learn and grow by providing tools and experiences to support their careers and future endeavors as leaders and community members. It is an intensive program of educational sessions structured around presentations, discussions, team exploration, analysis, consensus-building, collaboration, and case study activities undertaken over the course of a year. The 2014 class project is sited in historic Falls Church, where history and growth have collided to make planning and development an interesting challenge. Evan and the other participants have taken on the challenge to create a cohesive identity for the downtown community. Glavé & Holmes has greatly benefited from Evan’s involvement with ELA, and our team is excited to learn more from his experience. G&HA has had five other members of the firm complete the program in previous years, including Rachel Shelton , Jaclyn Miller, Jennifer Rhoades, Jennifer Wimmer, and Melissa Vaughn. For more information about the Emerging Leaders in Architecture program and to see the rest of the profiles, visit ELA’s website.